My son and I drove up top Mt. Hood for the day, and pretty much just sat inside my father’s cabin and then did some extremely light hiking. It was perfect. 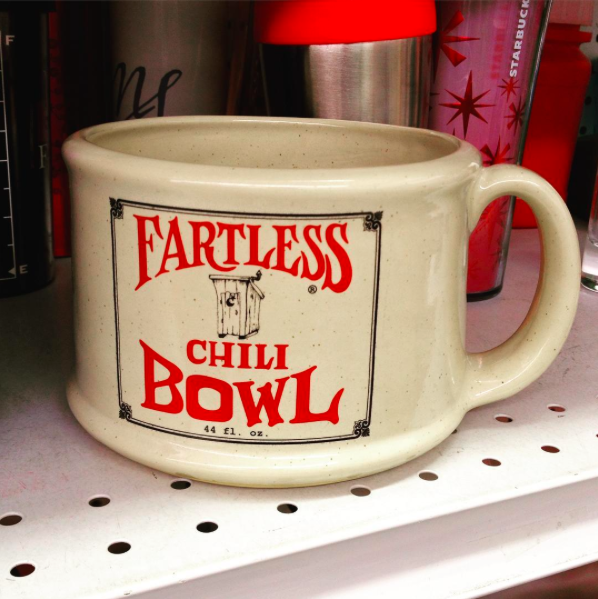 We stopped at the Sandy, Oregon Goodwill along the way where neither of us bought anything, although I did photograph the above “Fartless Chili Bowl.” Such a classy item, how could anyone have let it go?! My husband received a significant promotion at work, which moves us towards facing the two-kids-in-college situation that we’re about to hit. My husband cleaned out his locker at work and brought home a full handful of random change, which he added to my Found Change Challenge jar. My son and I stopped at The Dollar Tree on our way back from the cabin for a fresh supply of glue sticks. (He’s an art machine.) I wandered through the store a bit and discovered that they sell 32-ounce bags of dry pinto beans for a dollar apiece. Super cheap, so I bought two bags. Excellent for crock pot refried beans! Katy, I don’t think I’ve ever tried “retired” beans! Could be worse. My relative had 3 kids in the Universities at the same time. At least they are getting a 4 year breather between the first 3 graduating and the 4th one going to college. The upside of choosing a two child family, I guess. And you didn’t succumb to Pyrex loveliness! Just having fun: OK to assume that “crock pot retired beans” in your #5 is what goes into “fartless chili” (your #2)? Inquiring minds want to know. Sigh . . . autocorrect. Katy, I love that your guy is an “art machine”. I’m a recycle artist!! 1. My mother took my family and I out for dinner tonight to celebrate my “special day”..This is the day I was adopted 41 years ago! 2. Spent the day missing my dad, he passed away in September. 3. Going to my sons soccer game in a few minutes. I’ll bring my iced coffee from home and stay away from the concessions. 4. Went food shopping and bought everything I need for lunches/dinner this week so I won’t buy out. 5. Put more cigarette $ to debt because I’m 31 days smoke free! 2. Sorry for your loss, I lost my dad in sept of 1995 and some days it’s still tough. I will be thinking about you through your journey of grief. 5. Congratulations! Times are tough for you right now. Don’t let the strain of grief make you slip back into smoking. You are doing so awesome! Congratulations on both the adoption anniversary and the 31 cigarette-free days!! Goof for you for being smoke free! That is a hard thing to do. Congratulations on remaining smoke free for a month now! That is wonderful! My condolences on your dad’s passing. I lost both my mom and dad the earlier part of 2015 and I miss them both terribly, too. My heart goes out to you. So awesome to beat smoking! Best wishes to you on this journey! 1. I just spent $46 at the grocery store in hopes that I can make this last me for the next 2 weeks! I bought some lasting vegetables and will eat out of the freezer. I also am very excited that I got 4 boxes of pop tarts for $4! They’re my guilty pleasure from childhood. 2. I intend to not spend any money for the next 2 weeks (beyond my automatic bills) I have some hearty meals planned and have plenty of projects around the house to occupy me. The end of the month is going to be a bit expensive so I hope doing this in the beginning will offset it. 3. A friend’s birthday is coming up soon and she is celebrating for the whole week – I cannot afford to do any of that craziness with her so I’m hoping she’ll accept a homemade dinner! 4. I made $40 on Swagbucks in January and am very close to making the minimums on iBotta and InboxDollars – slow and steady but not super stressful income. 5. I am saving up for a washer and dryer and while I’ve been getting by using friends’ facilities or handwashing it was time to hit the laundromat. I have one that is a quick drive away that has huge washers and dryers – for about $30 I did a month’s worth of heavy laundry. 2 sheet/pillow sets, 5 blankets, and half my wardrobe. What I love about the laundromat is that I can do a month’s worth of laundry in about 2 hours with free wifi, cable, and a book to read. It’s not cost effective but it’s not bad for a temporary solution. Up to $50 in Lowes gift cards and counting! 1. Lazed around today doing laundry, and avoided going grocery shopping. Trying to eat out of freezer and pantry. Made a detailed list of what I have and the meals I can make from the ingredients. 2. My friend is an over- buyer and was throwing out asparagus and red onion. I rescued it. Trimmed off the yuck and steamed the asparagus- will use it in stir-fry. Used up . the onion in spaghetti sauce. 3. I like Bounce, but I cut them In half. 4. Washing my hair every other day. It actually looks better- less frizz. You didn’t buy a Lear jet! 1. Went to visit my parents for Sat./Sun., they generously took us to dinner and had meals there, only expense was gas getting there. 2. Received a bonus for work, going to transfer it to the car repair/brace fund account. 3. Watched the movie Goosebumps for free through Redbox. 4. Did a dog sit which paid for our dinner. Booked 4 cat sits 2 weekends from now, adding to the budget. 5. Awarded a scholarship allowing my daughter to play spring soccer. I buzzed my son’s hair with clippers. I made a hug vat of refried beans myself this week. We used up one quart and I froze two more quarts. We’ve also been using up gift cards for necessities like socks, soy milk, and printer ink. 1. Brought home some leftovers from our church potluck today and, with the addition of a few leftovers we already had, I had dinner with no fuss! 2. Was going to make homemade mac/cheese for the dinner, but ended up just adding more macaroni to two boxes of mac/cheese I had on hand, and added some shredded cheese to it. It was a big hit! 3. Made cookies for the dinner, too, using some break-and-bake dough I bought for another event that I ended up not using. One of the packages makes huge cookies, so I cut each chunk in half, to make smaller cookies. 5. Spent Saturday at a women’s brunch and then a baby shower, then served a baked spaghetti casserole I made Friday night for dinner when hubs came home from business trip. So, no cooking for me and no money spent (except for the baby gifts: a memory bear made by a friend from the baby’s great-grandmother’s flannel top, and a pair of $1 My Little Pony socks, an inside joke with the baby’s grandma and me). 1) I have a weakness for lattes. We all know how that adds up. I walk right past 3 cafes and straight back to my car after yoga. Made tea when I got home. 2) Went grocery shopping, stuck to the list 100%, and didn’t get a latte at the store either. 3) Cleaned our pantry, and double-checked grocery list so I wouldn’t double-buy. Planned meals around some existing items to be used up, including found sunchokes from our garden (we had planted them summer of 2014, and assumed we had pulled them all, then a volunteer came up this fall). 4) Popped across the street to the conventional store for powdered sugar, for half the price. Saved about $3. I know when to save and when to stick to the co-op! 5) We installed a new exterior light (we, I mean my husband), and it took about 2 hours. This doesn’t seem that frugal but we are REALLY BAD at these things and we didn’t breakdown and hire a handyman. Money saved by not hiring out and now our porch isn’t pitch black. Ditto. It is wonderful when things work out so well. What a deal on the beans! WTG! 1. Cut hubby’s hair (wishing I could cut my own decently..still holding out on a hair cut for a while. 2. Started counting calories = eat less, save more. 3. Turned the heat off today because it was beautiful outside! 4. Scored a $25 GC win and used it toward groceries this week, saving us $25. 5. I found an online pattern for making cloth pantie liners and look forward to getting started. I have saved worn out terry towels that will be great for the absorbent inside. I hope to find some good flannel material soon for the outer layer. Counting calories is the only thing that I have found works – good luck! Check out the “Cosmo” cut online. It is a layered do it yourself style. While I like the back of my hair shorter than it initially turns out, it can be easily shortened. I have cut my own hair like this for about 3 years and no one guesses I do it myself. I have a friend shorten the back for me. Heather, I can’t thank you enough for the advice on this cut! I normally have a bob cut, but have let it grow out for quite a while now just because I hate the wait at the salon and the expense of it. If you have a thrift store nearby that has a “sale” day, you can buy men’s flannel (real 100% cotton) XL or XXL shirts and use those as a source for material. Our thrift store has a 98 cent day for clothing with the oldest color tags a few times a year. Usually the clothing that is still on the rack by the time the sale comes has minor flaws (a stain, missing buttons, weird pattern, etc.). As a result, you wouldn’t be buying a “useful” or “still good” shirt to cut up, you would be repurposing! Also, thrifted flannel pj’s are a good source of material too. I about cried with incredulity I was laughing so hard the last time I set foot in a “fabric store”. Prices were insanely high for yardage. Me, myself and I, Thank you for the tips on finding flannel. Thrifting is what I intend to do to find material for my pads. For what they’ll be used for, pretty doesn’t matter, but may get lucky and find some nice designs. Like you, there is no way I’ll buy new at today’s prices. 1. Steamed cleaned my rug and chair using a small amount of laundry detergent in my machine.Been doing this for many years. Cleans well, smells great, is dirt cheap, and the furniture looks so much better. 2. Ate a piece of baked frozen salmon over wild rice(FFD from Kroger) with lemon wedges. Froze a bunch of lemons 2 years ago so I just throw a few in the pan when I bake the fish. They come out kinda roasted and perfect to squeeze over top. 3. Planning to build shelves in one of my windows similar to the ones Amy Dacycn has in her book as a curtain alternative. I want it for plants,starting seeds, and to grow herbs. We have the wood already so it won’t cost anything.Now to convince my hubby it will be a good idea. frosting from the freezer. I always make too much frosting so I throw the extra in the freezer. Moist and delish. 5. I continue to exercise at home for free. I am feeling much better than I did around the holidays so it’s a good thing. I know it my seem that the butter pecan cake may cancel out the exercise but I don’t like butter pecan very much. It’s mainly for my husband, I’m more of a chocolate girl. The cake may cancel out the exercise, but it’s still better than cake and no exercise. Made “Mexican” vegetable soup with leftovers ( home made beans, vegies, tofu, and a fresh pasilla chile). Made corn tortillas with leftover masa harina mix from the tamale party in December. I love the chili bowl! It made me smile. However, I don’t think that I would have bought it either. 1) My whole family has been under the weather. I have been making gallons of soup using frozen stock, veggies, and pantry items. It is nice to have it when you need it. 2) Since we haven’t been feeling well, we haven’t gone anywhere and have only spent money at CVS this weekend. Unfortunately, we needed Advil, zinc, and Theraflu. I used my CVS card and saved 20%. 3) I reviewed my budget and expenditures for this month. I was over budget in some categories , but under in others. This made my budget close to even. Yippee! I will make changes next month to lower my food budget especially. Groceries are expensive where I live . Sadly, there is not an Aldi or Grocery Outlet. 4) We have been quite unproductive this weekend — sleep, movies, books, and conversation. Free and enjoyable! 5) I didn’t book a cruise around the world as much as I would like to. Went to Target after church and only bought 2 things we needed plus a free prescription. Made a baby shower gift for a friend instead of spending money on something they’ll only use for a short time (I can’t resist baby clothes!) The rag quilt I made cost less than $20. Scheduled my CPR/First aid renewal at work, which will be free to me and I’ll get paid for the time. Made an appointment to get our roof cleaned instead of having to replace it like we originally thought. This should buy us a few more years. Agreed to host our annual friend’s Super Bowl party. I’ll dig up some appetizers from the freezer and they’ll bring food too. We don’t have to drive anywhere. I just had a new roof installed. When you get yours be sure to call your insurance company and let them know you replaced it. My insurance went down $500 a year. You may already know this but I just thought I would mention it in case it would help someone else. I just scheduled my CPR renewal class as well. My husband could renew it with me, but if I do it as work then I get paid for my time. You’re lucky you get paid for your time! My hospital pays for the cost of the class only, not my time (4 hours, at night, on site). 1. Made a huge pot of chicken black bean chili, all with ingredients on-hand. I baked the chicken first (bought on sale last summer) straight out of the freezer. Then I used about 3/4 in the chili and saved the rest to add to pasta dishes. We didn’t eat as much chili over the weekend as I expected so I froze quite a bit for future meals. 2. Baked pumpkin chocolate chip bread–half the batter in a loaf pan and half in cupcake liners. Froze the muffins since they make great additions to school lunches. I used a mix of pumpkin and butternut squash I’d previously baked, pureed, and frozen. 3. Went to a community event yesterday. Lunch was provided. 4. Went to a brunch for my cousin’s birthday . So filling I didn’t need to eat the rest of the day. 5. Received a free succulent from a friend whose cat was attacking it. It’s a variety I didn’t already have, but have wanted for some time. 1. Placed x2 2L bottles in the freezer to make it more energy effecient, and to increase our emergency water supply. 2. Hosted a friend for the weekend and resisted the temptation to eat out, instead making all meals from the freezer / pantry. 3. Continuing to harvest tomatoes and kale from the patch. Have been picking the wild blackberries that hang over our fence from next door (he doesn’t spray and his backyard is a jungle). Will store these berries in the freezer as I collect them and make pancake syrup at a later date. 4. Have beeing using husband’s home gym and going on bushwalks – all free and healthy. 5. Staying home a lot which is giving me time to cook from scratch, garden and organise my home. I am taking an extended holiday from work and at this stage I never want to go back!! I know I will but will be on a casual basis. Loved the cup -also glad it doesn’t reside in my house. 1. Got a $4 discount at grocery store for reaching a certain number of points. 2. Will redeem $25 in bonus points on credit card bill this month. 4. Drinking tea, soda and water at home – resisted buying when out and about today. 5. Didn’t buy any type of jet, but my frugal fail was buying a paper back mystery – expensive but fun entertainment. Hilarious bowl….I love finding “all” of the treasures at the thrift stores. 1. Went for a family bike ride today….got to enjoy some great weather and free exercise. 2. Didn’t spend any money all weekend. 3. Cooked some great meals at home from the freezer and pantry. I am turning into a decent cook. 4. Sold a couple items on the local FB yard sale site…love that the items will be used again and freed up space in my house. Plus, the cash is building up our emergency savings account. 5. Volunteered at sons skate night…free admission for him, great socializing for me and free dinner for me. 1. Eating at my parents’ tonight. 3 course stuffapalooza. 2. Made my French press at work. 3. I’m choosing to spend my lunch break writing my blog instead of nattering about work. It makes me happier than listening to people complain. 4. Went thrift shopping yesterday with my kids and got the most gorgeous pair of red and white 60s style knee boots for $7.99. Very ‘Mad Men’. 5. Reading The Happiness Project and thinking about what my Happiness Project might be. Damn autocorrect. I’ve been sticking *with it* for four years. I do love your Goodwill photos – who would buy that indeed but someone obviously did once! 2. Made vegetable stock with scraps I had been saving in the freezer. Will use to make soup later this week. 5. As usual, we did yard work and minor home repairs ourselves. 1. Went for a 9km beach walk with friends and only drank water from my stainless steel bottle while they all stopped for coffees. 2. Had pesto pasta for dinner using the pesto my husband whipped up using our home grown basil. 3. Spent the rest of the day reading my library book. One of about 20 I have on my bedside table. It makes me feel so rich looking at the pile knowing I didnt’t spend a cent on all that bookish goodness! 4. Went for another walk after dinner with my daughter and the dog. 5. Put my name down at a couple of job agencies for some part-time/casual work now that my 2 kids are both in high school. 6. Planned a week’s worth of frugal meals and I only need to buy some chicken for a stir fry. PS congrats Katy on your husband’s promotion! 1. Bought 3 pineapples at Kroger for $1 each. Cubed and froze it all for smoothies. I was so impressed by how much pineapple I got for $3, that now I’m considering stopping today for a few more. Strawberries will be on sale soon and I like having a nice variety of freezer fruit. 2. Sold a necklace and a shirt on ebay for $25. 3. Touched up the paint on my stairway banister due to weird stain that looked like coffee, but couldn’t clean off. Covered up several chips at the same time and now it looks so fresh. 4. I’m now in the habit of making a loaf of fresh bread about every 3 days. Leftovers for toast, which is a great snack for me at work. 5. I was using a vintage coated cast iron pot to bake bread, but I despised scrubbing it. Cleaned it up really well and listed it for sale. No sense keeping something I don’t enjoy using. I a reading a book gifted to me, Big Magic- Creative Living Beyond Fear by Elizabeth Gilbert. Fascinating! And beginning a new spring baby quilt quilt gifted fabric. Not money spent on wither and hours of pleasure will be obtained from both. I so would have bought that chili bowl/mug – warped sense of humor – hahahahahaaaaa!! 1. Stayed away from Kohl’s all weekend. 2. Used a free item coupon when you spend 10.- that I planned to spend on groceries. 3. Printed coupons on products that I use, nothing more. 4. Hung dry son’s clothing in laundry room. 5. Walked/ran on treadmill and looked up free yoga/stretching videos instead of falling prey to a PIYO infomercial and purchasing the set. 1. Making a grocery list of things that we really need in the house, and not the ‘wow that chocolate is at a good price’ list. 3. More time at home means, less time around town, wasting gas and spending money on food out before work. Congratulations, Katy, on your husband’s promotion! That will definitely help with a second kid in college. 1. Am wearing a favorite thrifted outfit today. 2. Ordered six month’s worth of coffee online, on sale, with a 30 percent off coupon, free shipping and $1.30 extra off in loyalty points. This makes the monthly cost for coffee at home $4.79. 3. My dogs are enjoying the homemade wet food added to their kibble. A month’s worth of homemade is half the price of the canned stuff we were buying. 4. Made two loaves of oatmeal-honey bread Saturday that used up the last of a jar of honey that was crystallizing. Got one loaf to eat now and the second in the freezer for later. 5. Made it through January with a food budget of $280 for three adults, and we still have plenty of stuff in the freezer. #2 — wow, that is excellent for coffee! I am so going to check out the food aisles in our Dollar Tree. That is definitely cheap for beans! 1) Eating lunch at home today, since I’m taking off at noon. 2) We will be heading to Bricktown this evening for our free hotel stay and NBA game. I’m excited. We watch our team on TV all the time, but we’ve never indulged in tickets to a game. We gave the extra tickets to friends and we’re hoping we can all meet for dinner beforehand. A treat for us! 3) I spent $3 on a large bag for the free skates I gave to my granddaughter. My daughter called this morning and said she plans to use that bag to store their Winter hats, scarves & mittens in the car too. 4) I gave myself a pedi last night. It always feels good to get the rough skin off my feet and doing it myself saves $40. 5) I didn’t buy a Lear Jet! 1) Made my morning coffee in a hand-me-down drip machine and brought in to work in a reusable stainless steel mug. 2) Brought my lunch from home. It consisted of leftovers from last Friday work meeting, on sale fruits and veggies and a cup of Greek Yogourt. Everything was in reusable containers, and I ate with real silverware. I also always keep a tea towel in my lunch bag instead of paper napkins. 3) Made some tea after lunch, using the kettle I keep in my office and tea bags I bought for half-price from the grocery store clearance bin. 4) After work, I’ll go to the gym and use my refillable water bottle (freebie from work) instead of buying a water bottle there. I’ll make sure to fill my bottle at work, since the water at the gym taste funny. 1. Cleaned my carpets with my own carpet cleaning machine this weekend. I’ve never found a used one, so I bought it new, but it has paid for itself since then, as opposed to renting over and over. I have pets and a husband who spills things a lot. Sometimes I use an organic, pet-safe cleaner, but most of the time I use vinegar and hot water. 2. Had one lonely 5-6″ piece of delicious farm-made link sausage leftover. I put it on a bun that was getting to the end of it’s freshness and added homemade sauerkraut. It made lunch for my husband, and he loved it. 3. I cooked beets which had wilted tops. I roasted the beets and sautéed the tops anyway. They tasted just as good as ever. 4. Used some reward points to gas up the car for $1.59 a gallon while running errands. 5. Bought a gift at half-price for a granddaughter’s birthday. It’s a month away, but the deal was now. Katy, congrats to your husband on the promotion. 2. When I did fill up yesterday I got 30 cents off per gallon with my fuel perks card. I then put air in my tires at the free air pump at the gas station. 4. made no parking signs for my driveway with supplies I had on hand instead of buying them. For some reason the people who stay at an Airbnb three houses down the street from me feel that they are allowed to park in my driveway. 5. I treated my very hard working staff to dinner during a long work day this weekend. I was able to use a gift card so I was able to feed 5 people for $10.00. I was tired of looking at random charges on my card last month so my husband and I threw all the cards and extra cash in the jar on the counter. Now if we need money we have to take it before we go somewhere or else not buy it on a whim. Hopefully that will stop the full out heart attack when we open next month’s credit card bill. 1. A bought several boxes of Caveman bars at SAM’S Club. They had been ~$18/box and were $2.31/box the other day. They’re great to throw in a lunch box. 2. My produce box included giant red delicious apples. Into the crockpot they went with some other apples and a couple of pears. After they were cooked I threw in a bunch of cinnamon and some blueberries. Delicious. 3. I invited a friend to come over for lunch on Thursday. Healthier, cheaper, and more relaxing than eating out. 4. It was in the fifties and sunny yesterday, perfect weather for a long walk with my husband. So what if there was still a lot of snow on the ground. 5. Figuring out dinner, based on what we have on hand. 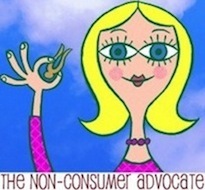 I learned about the Pantry Principle of shopping and cooking many years ago from The Tightwad Gazette. I’d say I follow it about 95% of the time. Congrats to Mr. NCA! Wooohooo! Trying very hard . . .
1. Bought $40.oo worth of groceries to supplement what we have this week. Should only need to get fresh veggies and eggs. . .
2. Turned Meh meatloaf that no one really liked into a slightly less Meh soup and used up some old carrots, celery, and half box of pasta plus last of raw ground turkey. Served with last of the of the 83 cent bag o’ salad. Tossed kale portion of marked down bag o’ kale salad into soup; husband used croutons and dressing for salad; we both used the packet of shaved parm in soups. Got my 99 cents worth! 3. All breakfasts, lunches and dinners from home Saturday night through this coming Thursday night. 4. Searching for Winter clothes — coat, boots, mittens — for upcoming non Frugal trip to colder clime. Tried thrift store — they were charging $20 and up. One black wool coat was $65.00! Checking Ross, etc,. no luck here in So Cal. Will have to try some different thrifts and even big clearance at (gulp) Macy’s. Sometimes their deep clearance plus coupons rivals or beats Ross, etc. Sticker shock at the thrift store. . .
5. Reading library books — and being forgiven any overdue fines for the next 2 weeks. Thank you LA public library! Ordering book club book through library loan. Rather than trying to find winter clothes in SoCal, you might want to wait and go thrifting at your destination. One of my niece’s best friends from Florida came to visit over Christmas along with her three kids. My niece had a few winter things to loan them, and I dug through stuff too small for my kids and came up with jackets, wool socks, ski gloves. What we couldn’t provide, she easily found at the thrift store–and cheap. You could probably also find winter clothes on end-of-season sales wherever you’re going. I was thinking the same thing. Winter things are already on sale so they you will find them much cheaper at your destination if you are able. 1. Have 3 days of volunteering/work that involve food so at least 3 days of free lunches – and realistically there will be some brought home too. 2. Baked non-grain dog treats. I feed my dog grain free food but he scratches a lot and changed the recipe for his home-made treats. Using Trader Joe’s coconut flour which is 1/2 the price of what I found on Amazon. 3. Listening to podcasts as I walk the dog – exercise and entertainment. 4. Reading library books – and I too love the giant stack of books waiting to be read – but also sometimes overwhelmed by the stack. Good news is that you can always request them again if you don’t read them before due. 5.Went to 2 estate sales last week and got some lovely vintage flat sheets and pillowcases for less than $1 each to mix and match with my white fitted sheets. So pretty!! Can’t wait to hang them out in the fresh spring air!! * I have done amazingly well at the grocery store today! With all the sales, the discounts on top of the sales, the price matching and the coupons, I saved 193$!! Total cost : 118$. * Going to the movies twice this week with free tickets, and bringing people along with me. * Went to a thrift store sale and got a 2 pair of pants, a pair of jeans with tag still, 2 bras and 4 shirts for a total of 6$!! This seems usual prices for thrift stores in the USA but not here!! Never seen prices like this before in a thrift store. * Started counting calories again to lose weight. This means less food = less groceries. Lost 5.5 pounds in January, about 75 to go. I’ll get there!